Omega-3 fatty acids have attracted a lot of attention from protagonists of healthy diets, and from the food industry as well – view their ads. Fatty fish like salmon and sardines are important natural suppliers of these substances to the human diet. But an increasing share of fish comes from fish farms; and much of their food comes from fish meal, for which 16 million tons of wild fish are caught annually. Therefore this food chain is becoming unsustainable. Omega-3 fatty acids produced by natural marine algae, as a food supplement to both humans and salmons, will solve this problem. And solve one of the main problems in the vegan diet as well. 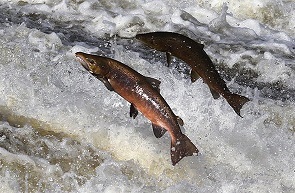 Fish like salmon used to be the primary source of omega-3 fatty acids to the human diet. Omega-3 fatty acids are called ‘essential’ because the human body cannot synthesize them. Strictly speaking, this is only true for ALA (alpha linoleic acid) that we ingest mainly from vegetal sources like walnuts. In principle, the body can synthesize the other important omega-3 fatty acids DHA (docosahexaenic acid) and EPA (eicosapentaic acid) from ALA, but this is done at most quite inefficiently, and some humans (like Northern Europeans who have relied on a diet rich in fish for many centuries), have almost lost this ability. DHA and EPA deficiency has been correlated to health problems like impaired brain functions, problems with the immune system and an increased susceptibility to Alzheimer’s disease, cancer and vascular problems. Ageing people have been shown to require a higher daily intake of DHA. For these reasons, dieticians strongly recommend a diet with fatty fish like salmon, herring, mackerel or sardines at least once a week. But this is no solution for vegans. Moreover, there may be a catch for fish lovers as well. The omega-3 fatty acids are only present in fish that has eaten its natural plankton diet. Many fish farms feed their fish on a diet derived from wheat or soy, and then the amount of DHA and EPA in the fish is much lower. Nowadays we can also produce omega-3 fatty acids from corn by marine algae. So it’s good news that in the North Pacific scientists have discovered Schizochytrium sp., an alga (or strictly speaking a cyanobacterium) that naturally produces the omega-3 fatty acids EPA and DHA from a variety of sources, including glucose from corn starch, by fermentation. This secures a supply of these essential nutrients without relying on marine ecosystems. Evonik and DSM have commercialized this technology. 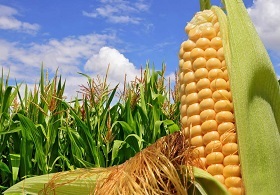 They founded a 50/50 joint venture called Veramaris, that has just commenced the construction of a $ 200 million production facility at the Evonik site in Blair, Nebraska, in the middle of the US corn belt. As the Biofuels Digest put it, they’re ‘cutting out the middle fish’. For in the ocean, the omega-3 fatty acids producing algae are eaten by krill, these by small fish like sprat and these again by salmons – that’s how these substances end up in our diet. The Veramaris production line makes these steps in the food chain redundant, the substances are fed right into the fish feed – or into human nutraceuticals. The Biofuels Digest calls this production line ‘a featured first high margin, decent volume product for algal technologies at scale’. Commercial quantities of the algal oil rich in EPA and DHA will be ready for sale in 2019. Pilot quantities for market development purposes are already available. The initial annual production capacity will meet roughly 15% of the total current annual demand for EPA and DHA by the salmon aquaculture industry. 1 kilogram of algal oil can replace 60 kilograms of wild-caught fish. I enjoyed your article, but wonder why you didn’t mention seaweeds for a source of Omega 3s. Is it because you do not think of seaweeds as edible? Right now I have some dried hijiki in my rice cooker cooking together with rice; in an hour the hijiki will give me its DHA.